Like so many world cities, London is gradually transforming into an urban landscape of sky-high tower blocks carved out of metal and glass with the most imaginative names varying from the Cheesegrater to Baby Shard. At the moment building plans for over 200 new high-rise buildings have been approved or are awaiting approval. The sad thing about this is that they most likely won’t offer anything valuable to ‘normal’ Londoners, but will merely be made into luxury apartments only affordable for overseas investors (and stay empty most of the year), hotels and even more office and retail spaces. When the ‘Walkie Talkie’ was approved to be built on 20 Fenchurch Street, the deal-maker was its public park at the top of the building. And thus earlier this year they opened the doors to their Sky Garden on the 35th floor to the public from where you can enjoy a spectacular view over London, all for free. Compare this to the ticket price of almost £25 at The Shard and you will understand that a free ticket to the Walkie Talkie is highly in demand. Luckily I have a well-organised husband who booked us tickets and brought me along on a surprise trip. Of course I took lots of photos to share with you! Straight ahead you see the Walkie Talkie (or 20 Fenchurch Street as is its exciting original name). You might remember the news stories two years ago of melting cars caused by the sun reflected by a huge tower block? Yep, that was this cheeky guy! Your view from one side of the Sky Garden. From left to right you see Tower 42 (42 floors of office space), The Leadenhall Building, or Cheesegrater, (48 floors of office and retail space) and 20 St Mary Axe, better known as The Gherkin (41 floors of office space with a restaurant on the 38th floor (where I once had a very posh lunch!)) Time for a little game! 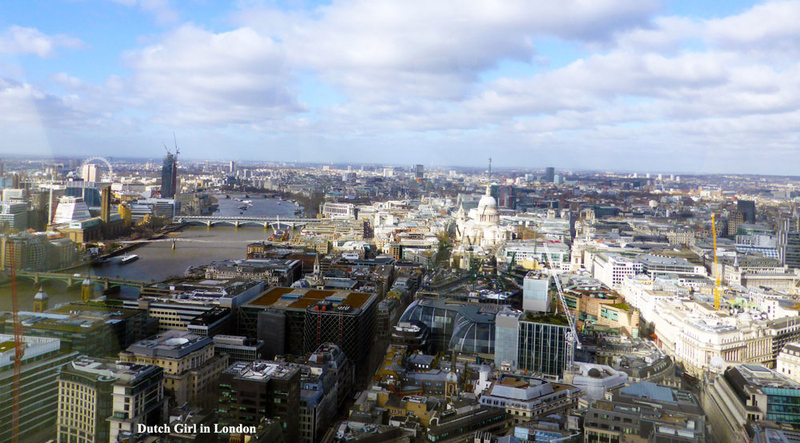 Can you spot the monuments and London icons among the dozens of buildings cranes in the photo below? Click on the image for a bigger version. Okay, here’s some help! On the right of the photo you can see St Paul’s Cathedral and on the left you see Tate Modern with Shakespeare’s Globe Theatre right next to it, the Millennium Bridge and The London Eye hiding in the back. That beautiful white building is St Paul’s Cathedral. Here’s the other famous tall guy in town: The Shard. This giant is 71 floors high and accommodates restaurants, a hotel, viewing platform and offices. In the distance you can even see the skyline of Canary Wharf. 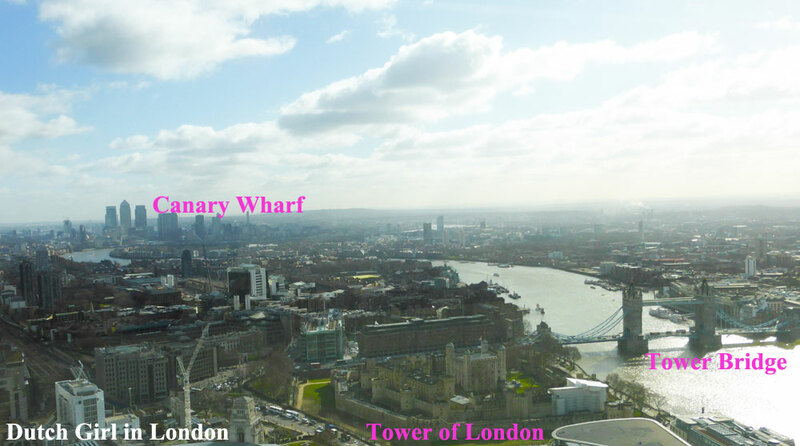 Click on the photo below to view the Tower of London, the beautiful Tower Bridge and Canary Wharf skyline. Here on the left you can see City Hall (Boris Johnson’s office) and the HMS Belfast (a nine-deck warship, now a museum). Finally some photos of the Sky Garden itself. You can do as I did and just have a wander around, try to spot as many famous London buildings as possible and take lots of photos. But you can also sit down on the terrace, at the bar or restaurant for a drink and a bite to eat. Be warned for the high prices though. And low temperatures for that matter. You will find that there is a reason the staff is clad in scarves and beanies for a reason! Do you want to visit the Sky Garden as well? Then book your tickets online via this link and bring your reservation confirmation and ID with you when you visit. Note that tickets are in high demand and it might be difficult to find free spaces at the moment. You can’t get access without a reservation! You can now follow my blog on Bloglovin! Posted in things to do London and tagged 20 Fenchurch Street, activity, free, London, skyscraper, things to do, view, Walkie Talkie. Bookmark the permalink. As a londoner handyman for quite a few years no, in my humble opinion, there is absolutely nothing more spectacular than the view of the city from above! My personal is London at night. Tower bridge as a splendid sight to admire! If you ever have the chance you should really go for a shoot from above! Just make sure you set up a more handy camera with higher resolution. A regular DLSR with a decent lens (at least f2.8) will do great, but a full frame will totally nail it! Hi Dima, Thanks for your nice message! I appreciate your comment about the broken link. Looks like they changed the URL for it so I’ve changed it now as well in my article. Bedankt voor deze tip. Afgelopen maandag geweest. Het was helaas niet helemaal helder, maar toch leuk om alles van bovenaf te zien. En, ook mooi meegenomen; gunstig voor het vakantiebudget! This is something that we have been meaning to do for an age – I wonder if you can get tickets on the day now!? Hi Emma, I’d recommend you book a ticket prior to your visit, just to avoid any disappointments especially since to could be even busier now in the summer time. Just try the link I added in my post. A great suggestion for people who are about to visit London! Especially when money is tight, this is a very good alternative. Great photographs! Thank you!